There's a new game from RTG in the mobile casino at Slotastic today and a new slot in the instant play casino as well! 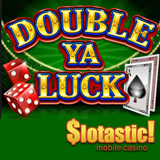 Double Ya Luck, now available in the mobile casino for smartphones and tablets, combines the thrills of slot machines with the fun of board games. Penguin Power, the new instant play casino game, brings the playful antics of baby penguins – and free spin prizes up to 100X -- to the instant play casino.